The medical advice usually appears on seemingly reputable health websites or even homepages of local family doctors. Additionally, consumers are lulled into thinking the information must be correct because it appears high on Google. Nothing could be further from the truth. We are privileged to live in an age overflowing with information. With access to the entire world's knowledge literally in our pockets, there is never an excuse to have dinner debates about the date of Michelle Obama's birthday or what year Pete Rose was suspended from baseball. Even more than the random useless trivia that we draw from the internet, we pretend the internet can substitute as as our parents, our lawyers and even our clergy. 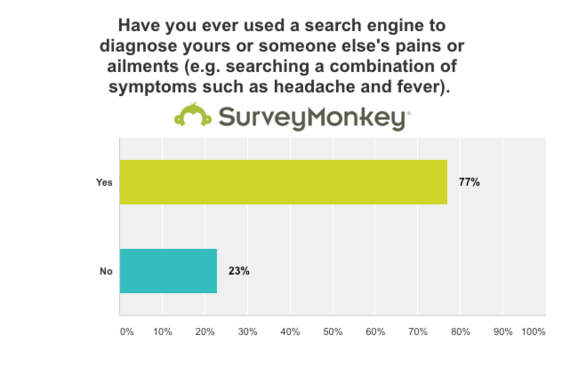 One major area of online search is health. Our child wakes up with a cough, we Google it. We find a rash on our arm, we ask Siri to Google it. We even ask Google to diagnose multiple symptoms (bad idea: the results usually, falsely, point to a deathly disease). We use the internet to crowdsource our kid's allergic reactions and post on Facebook for insight into food poisoning. 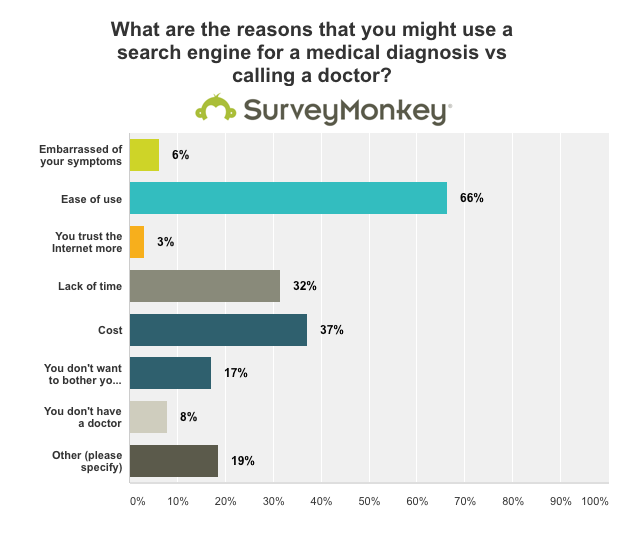 According to a survey I conducted on SurveyMonkey Audience with 395 random Americans, 77 percent of respondents admitted to going online to diagnose medical symptoms. 52 percent of people even used an image search engine like Google Images or Pinterest to diagnose a skin condition. When respondents were asked why they went online instead of reaching out to to a doctor, nearly twice as many stated "ease of use" vs. cost. While many medical professionals are opposed to this practice, there are others that think it's a great idea. According to these medical professionals, searching online for answers to health issues leads to a more engaged patient and even allows people to figure out if a "nasty rash" is a mosquito bite or a creeping parasitic infection that requires a trip to the emergency room. Self-diagnosis might even be a good method to reduce the load on the health care system by empowering patients triage themselves. However, there is one major issue with this hypothesis: Much of the medical resources on the web is horrifically inaccurate. The authors of the vast trove of health information on the Internet are not trained medical professionals. Rather, they are "content marketers" hired to produce articles to rank high on Google searches. That means that much of Google's highest ranked medical advice is written by a person who's job is to simply bring people to a website. Lacking the medical background to write original medical information, content marketers source their writing from other websites. While the CDC, NIH and even WebMD are great medical resources, their knowledge will likely be mixed in with datapoints from other online medical "luminaries" like Yahoo Answers, Wikipedia and various marketing pages designed to sell a product. For the discerning content marketer trained to ignore user generated content, they instead source content written by other content marketers thus contributing to the ever growing cycle of manufactured, and often false, medical advice. "There are ample examples of how doctors who have taken an oath to 'do no harm' respond to financial and other incentives in ways that do harm patients," says Josh Steimle, CEO of digital marketing agency MWI, citing a 2015 Los Angeles Times article that explores variances in the rates of c-section births in Los Angeles area hospitals. "I have great respect for content marketers and doctors, but should I believe that content marketers, who haven't taken anything like the Hippocratic Oath, and aren't nearly as sensitive to the harm they may be doing, are producing accurate health information online when it may not be in their best financial interests? It's great for patients to do research online, and there is valuable work content marketers can do to put helpful medical information on the internet. But since we can't even trust doctors 100 percent of the time, it's up to patients to do thorough research and make sure the information they're getting is accurate." To a patient in need, it is not obvious that the health care information found online was not produced by a medical professional. The medical advice usually appears on seemingly reputable health websites or even homepages of local family doctors. Additionally, consumers are lulled into thinking the information must be correct because it appears high on Google. Nothing could be further from the truth. "Depending on the scenario, relying on inaccurate medical information could have deadly consequences when wrong advice is given," says marketing visionary John Rampton. "While there are certainly laws and codes of ethics that require content produced online to be correct, content marketers might not even be aware that these laws even exist." 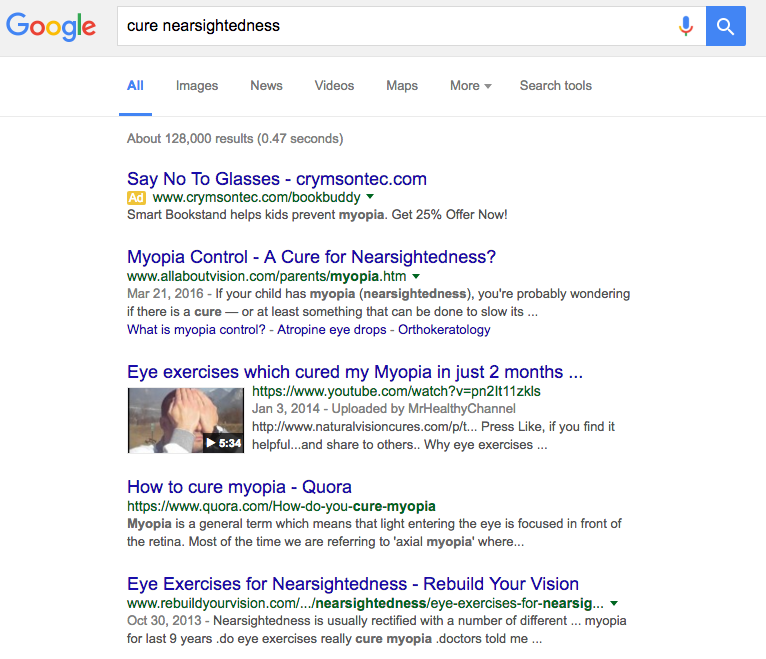 To illustrate the scale of this issue, let's look at a very standard Google query like "cure nearsightedness." Most eye care professionals would say that there is no way to revert nearsightedness. However, if a layperson searches such a question online, they would be led to believe that indeed, nearsightedness is curable. Without linking to any particular results (I don't want to send people to these pages), there are particular websites that offer unproven and false ways to "cure" nearsightedness. Consumers may not be aware that the motivation behind these websites is to sell a product rather than share information. In this case, the harm is the false hope of an eventual cure, but the risk is far greater when it comes to advice about "eating salad to stave off cancer" or following diets that deprive the body of essential nutrients. It's worth it to note that all is not lost in the fight against this tide of unverified and bogus content. In the beginning of 2015, Google started showing medical information in the knowledge graph. While, Google uses an actual doctor to verify these answers, these verified results will likely only show up on the limited amount of queries for which Google is able to curate the results. One in 20 searches conducted on Google are for health related queries; therefore, the trend of using Google in lieu of a doctor is likely to grow. This challenge of keeping us protected from bad advice is set to become even more critical as more users turn to the internet for daily questions. 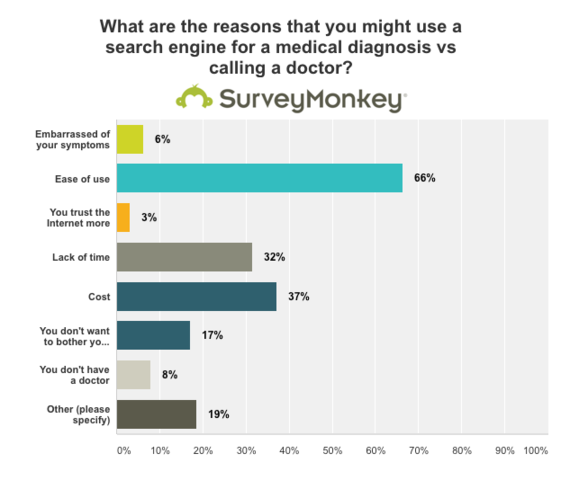 In my survey, the majority of users only looked at 1-2 websites for medical advice, so provided Google can keep these top results accurate, they limit the exposure to factually inaccurate results. If you are questioning why people even bother creating content that Google will keep out of the top results, you are not alone. That's an answer for another article. In the meantime, you can rest assured that the runny nose you have is probably not the Zika virus. 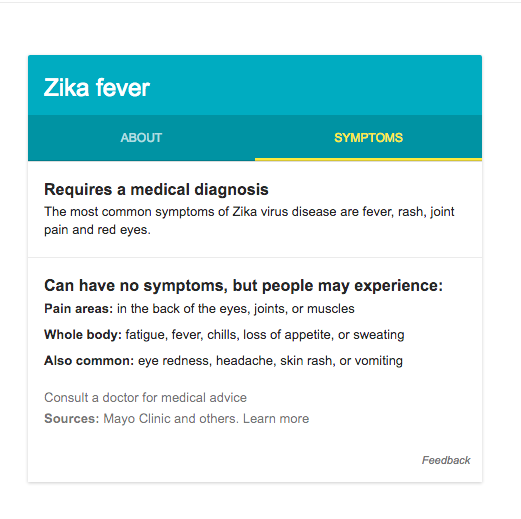 But just in case you are concerned, here are the actual symptoms of Zika on Google as approved by a doctor.